Loyalty before royalty…. What does this mean? You must act as your conscience says. Believe in self rather than outside influences. The two most important loyalties in any business are customer loyalty and employee loyalty. The cycle below explains why these two are inseparable. It will be more expensive to attract new clients than to keep the ones that are already supporting your business. You save on marketing costs and it is easier to sell to an existing client. A satisfied client will keep on coming back to you. Referral marketing is a structured and systematic process that maximises word of mouth potential. Some of the treatments in a salon and courses in a school which are offered: nail technology, make-up, manicures and pedicures are a walking advertisement for your business. Communication must be frequent. Client cards are of utmost importance. Always keep a database of your clients, remind them what you have to offer, remind them when it’s time to book a treatment. Show your care by sending birthday messages etc. Email your students and inform them of what your focus of training is each month. Set up a reward system. This way your clients will feel their loyalty is recognised and appreciated. Offer a reward card where they receive free treatments or points after having a number of paid treatments. Offer special gifts and prices to your loyal members. Great customer service. A client will always remember the way you made them feel. Whether it was positive or negative, they will tell their family and friends. Feedback is a great way to communicate with your clients. Smile. Greet and welcome your clients with a smile. A study in the UK showed that customer spend up to 67 percent more if they were greeted with a smile. Even when speaking over the phone, a smile can be “heard”. Quality of your product or service leads to client satisfaction, which leads to loyalty, which leads to profitability. But this all begins and ends with your employee loyalty. Employees are the pillars of the business. 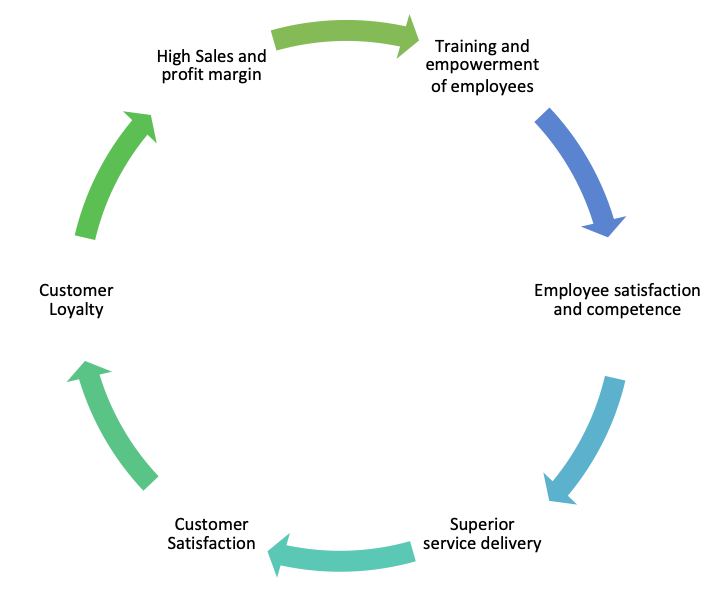 Employee loyalty will give you a competitive advantage. Employees wants to feel the business values them, and rightly so. Empower your employees by trusting them with management and leadership tasks. Let them be involved in decisions about the business. Always keep communication Show interest in your employees’ life. Try to connect with them all in one meaningful way or another. Treat your employees with respect and trust. A trusted and respected employee is a loyal employee. Give the employee recognition when it’s due. A pat on the back always pushes the chest out leading to them feeling proud of themselves. Be the example for your employees. If you are not loyal to them, they will not be loyal to you. In any business, nothing will guarantee you more success than loyal customers and loyal employees. Blog written by: Alida Fourie, Principal and Educator: Beauty Therapy Institute Bloemfontein. For further information on the Beauty Therapy Institute group of training colleges, please contact Sandy. Email: sandy@beautytherapyinstitute.co.za or call +27 83 457 1965.